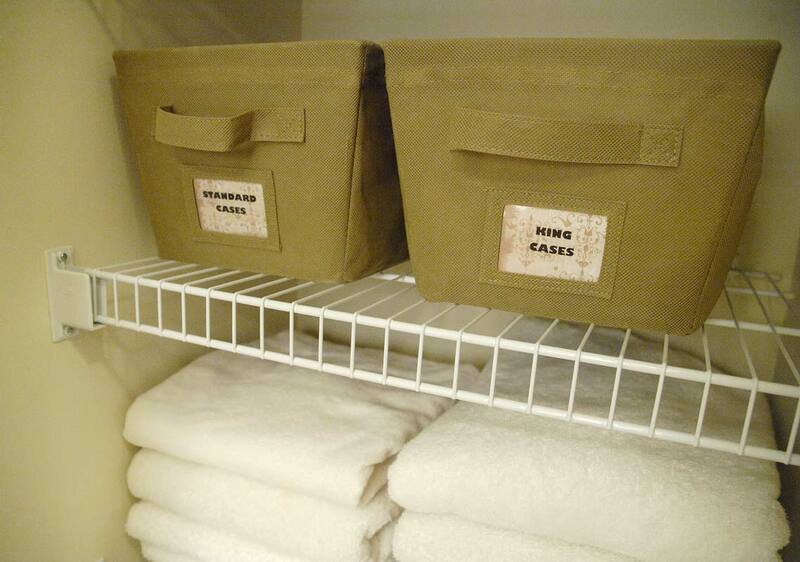 Since spring has still not sprung here yet, I figured today would be a great day to finish organizing the bathroom linen closet in our upstairs guest bathroom. We recently renovated that entire room, so if you haven’t had a chance to see the before and after photos, click here. I love what a few labels and $5 Walmart storage bins will do for a space. 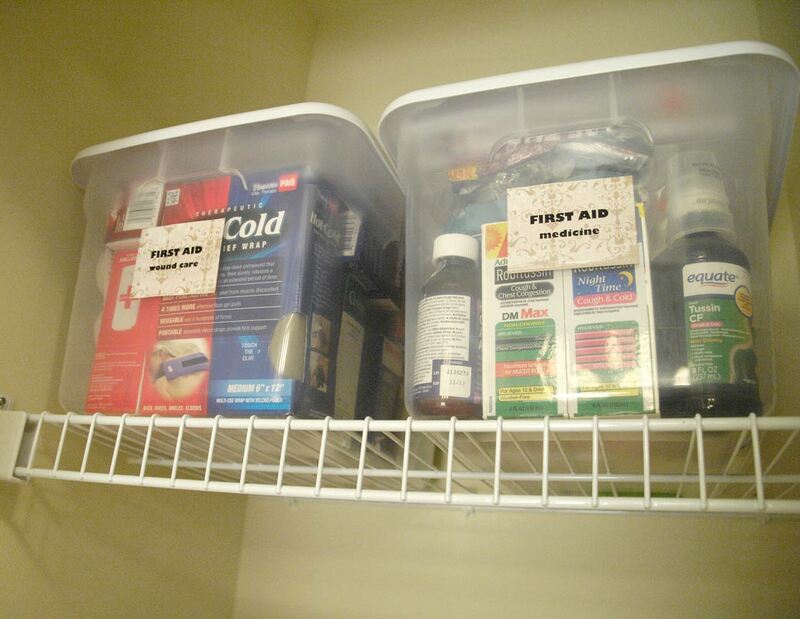 I keep our first aid supplies on the top shelf so curious kidlets aren’t tempted to get into them. Our family has been using white bath towels exclusively for probably about 10 years. They are easy to clean (hot water and bleach, if necessary); they don’t show wear like dark towels; and they give the bathroom a bit of an upscale hotel vibe. 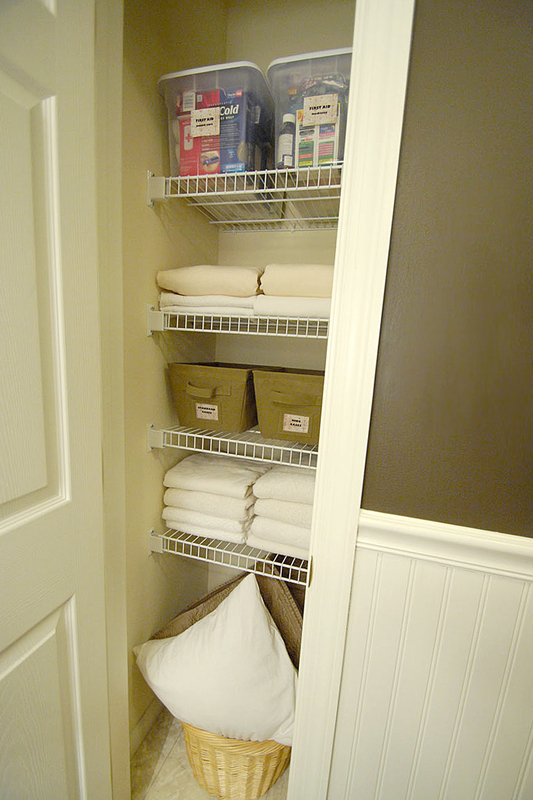 Do you have any tips for organizing linen closets? 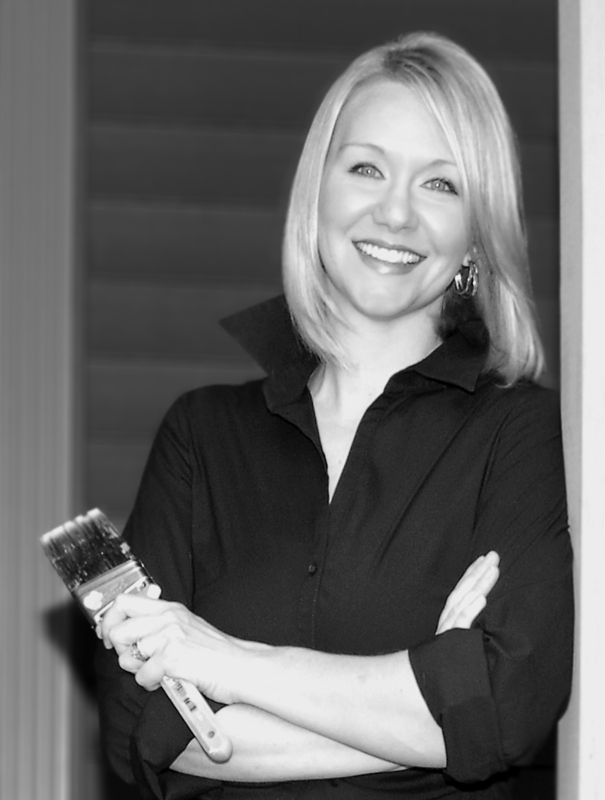 I’m linking this up to We are THAT family, DIY by Design, Tidy Mom and Thrifty Decor Chick. 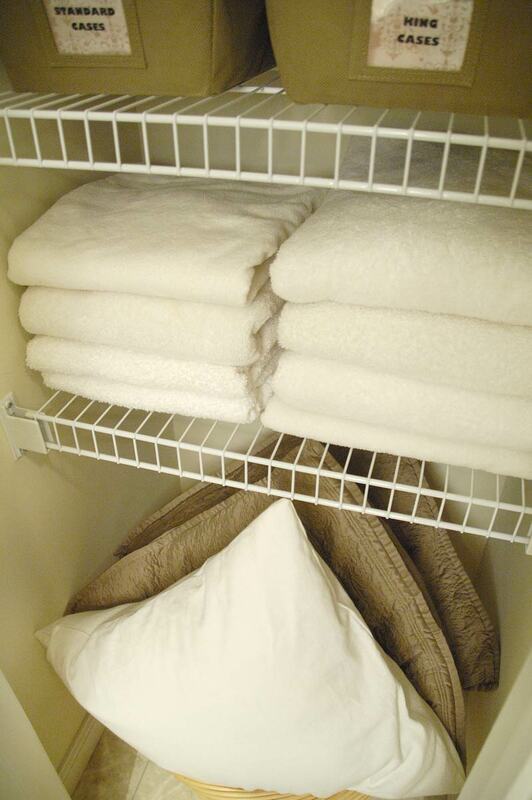 This entry was posted in Bathrooms, Closets, Organization, Videos and tagged How to fold fitted sheets; how to fold a fitted sheet; video on how to fold fitted sheets by Susan. Bookmark the permalink. I can’t wait to try this with my King sheets! I have watched other folding videos SEVERAL TIMES and still have not mastered the fold! Thanks for the encouragement! I hope it works for you this time! It took me forever to figure it out, lol. Please let me know if you have any trouble. Thanks for stopping by. I have probably watched your video 6-7 times. Last week my King sized sheet looked better and today, my folding job is FANTASTIC!!! Thanks for sharing! So glad you were able to master the art of folding fitted sheets, Lynette! 🙂 It is a bit tricky, isn’t it? It took me awhile to figure it out myself. Your closet looks great! And I love your idea of using only white towels. One tip (and it’s more decorating than organizing): I have some clear, labelled plastic bins, but I didn’t really like how one could see everything in them (but didn’t want to buy anything new), so I simply taped a piece of decorative paper on the inside, so the pattern was shown on the outside. Looks very cute. I found your site through a search for fitted sheet tutorials on YouTube and want to thank you! You’re so right–the other videos are so vague, and yours helped me figure out where I was going wrong. I’ve wanted to master this for years because it just seems like a skill every adult should have. Thanks again! Thanks Michael. Glad is was helpful to you.